Last week I had the fantastic opportunity to travel to Birmingham to attend a 3-day course/workshop organised by Historic England, in collaboration with the West Midlands Fire Service. The course was titled ‘Salvage and Emergency Planning’ and was made up of practical and desktop exercises, as well as lectures, on all things salvage from museums, historic houses and archives in case of a fire or flood. The course was taught by Charlie Harris (Fire Safety Adviser for Historic England), Beth Stanley (Senior Collections Conservator), Christine Murray (Preventive Conservation Adviser for the National Trust), Fiona Macalister (Independent Conservator) and Nick Hunt, Mark Ralston and Clive Williams (all from West Midlands Fire & Rescue Service). The course was centred around the importance of developing a good relationship between a museum, archive or historic house and their regional Fire & Rescue Service in preparation for an emergency event taking place. This relationship should involve working with the Fire & Rescues Services to, in effect, make them aware of the salvage and emergency plans in place with a collection. 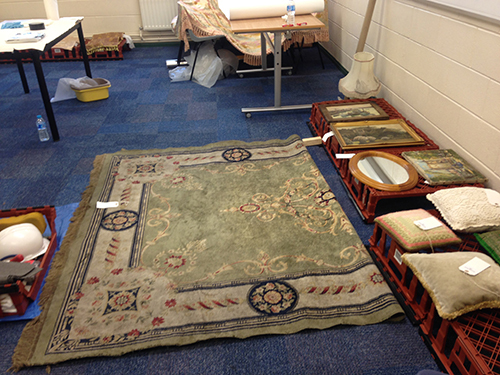 Obviously great focus was also given to salvage procedures and the treatment of water damaged items in particular. We started out with the fire side of things with Nick, Mark and Clive all giving us valuable ‘inside’ information about the way in which the Fire & Rescue Services operate. For example, different members of the team can be identified by their helmets. 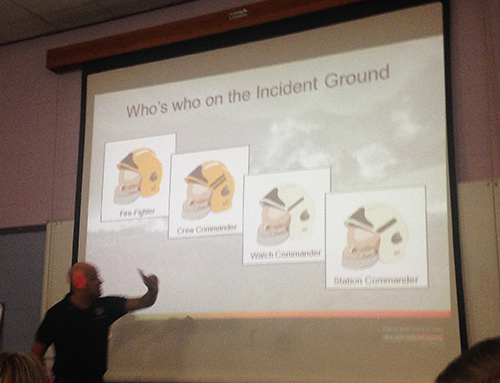 The hierarchy goes from Fire Fighter, Chief Commander, Watch Commander to Station Commander. We also had discussions and practices on more general (and often forgotten) health and safety procedures. I thought this was an excellent aspect of the course, as when an incident happens in an archive/museum/historic house situation, it is important for the salvage teams to have clarity on who they need to speak to and liaise with. Fire & Rescue Services’ first call is to save lives, but they will help with the salvage of historic and archival materials. One of the most valuable and eye-opening exercise was to experience first-hand what fire fighters face when they enter any building. The house in which we did all our practical exercises had been set up as a historic house with various pieces of furniture, books, paintings, crockery and archival materials. We entered the practice house in groups, in the pitch black, with smoke (‘club smoke’ in this instance!) surrounding the place. We went up and down stairs with zero visibility to attempt to find the fire, which ended up being located on the top floor of the 3-storey training house. It was incredibly disorientating, confusing and scary – even in a practice situation. I had massive respect for the Fire & Rescue Services before, but this has increased tenfold after this ‘hands on’ experience. 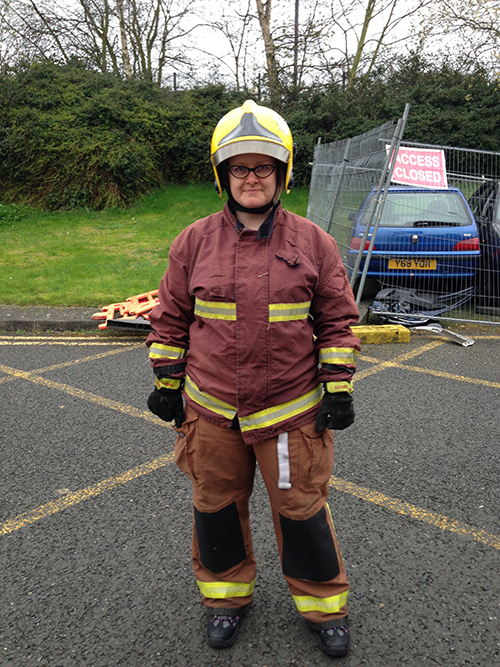 And yes, we were kitted up with the gear…. Who says conservators don’t get to wear uniforms? In our fire training instance, one person was unaccounted for, so saving a life became the priority for the Fire & Rescue Services. Thankfully, they were rescued unharmed… if a little floppy. The other main aspect was going through and practising various flood, burst pipe and other water-related -scenarios – getting rather soaked in the process! The water exercises were an absolutely priceless training experience – using tarpaulins, various pipes and a massive selection of other materials to channel water away from the object(s) at risk. For example, working in teams to resolve the best way forward in a running-water-gushing-onto-your-priceless-historic-bookshelf -situation was very rewarding, but also very challenging. 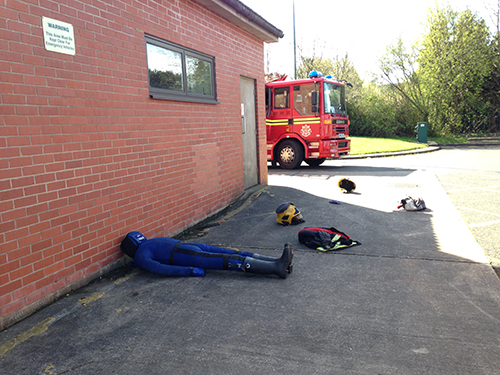 The panic sets in, and did so even in a training environment! The practice run also highlighted the importance of one person taking the lead, but while doing so involving all other members of the team in decision making and problem solving. Physically practicing emergency and salvage scenarios also can not be stressed enough! Having the knowledge of the Fire & Rescue Services’ staff structures is helpful, but what is glaringly obvious is that the staff in an archive/museum/historic house needs to have their emergency staff stuctures clearly allocated if the worse was to happen. These usually include, in hierarchical order from ‘top’ to ‘bottom’: Incident Coordinator, Communications and Welfare Officer, Documentation and Inventory Officer, Quartermaster, Salvage Teams Coordinator, Recovery Teams Coordinator and Salvage Teams (wet and dry). These teams can usually also include Observers, who tend to be external people or people outside of the immediate work unit. Obviously with a smaller team this can become problematic, so this means engaging and training other colleagues and/or ‘external’ people in the specific salvage program and plan. Every member of a salvage team should know – and practice, then practice again – the role they are responsible for in an emergency situation. However these roles can, and will, be fairly fluid. As you can imagine, it is very easy to panic, so team work and looking after your team members’ welfare, while not forgetting your own, becomes incredibly important. Its is essential to have clear plans on priority items (aka ‘grab plan’). This information should be printed and laminated, so it can also be passed on to the Fire & Rescue service on site. When items begin to come out of the secured premises at which the fire or flood has taken place, clear labelling on where they have come from, documentation on the Incident Coordinator’s exchanges of information with the Fire & Rescue Services and who enters and leaves the building and at what time are very important. We were told the Fire & Rescues Services, once a relationship has been created, are more than happy to be instructed on the correct handling of items too, so this should not be shied away from. The response to a situation includes the emergency conservation and preservation procedures. The Salvage Teams, with direction from the Salvage Team Coordinator, lead on the wet and dry recovery of items, separating these as they come out. When items have become wet, the importance of being able to start to ‘deal with them’ quickly can not be stressed enough, as mould can very rapidly become an issue. We practiced hands-on techniques and were given tips and guidelines on how to deal with wet items varying from photography and books to taxidermy. Wind tunnels were created for books to dry by using tarpaulins, plastic crates and fans, while other items such as rugs and cushions were left to air-dry. PS In terms of fire prevention – test out whether your extension lead can handle all the equipment plugged into it with the socket overload calculator provided by Electrical Safety First online. Go ahead, give it a go! It can get a little terrifying though. … back in August this year I applied for a Continuing Professional Development grant from a funding pot held by the Anna Plowden Trust / Clothworkers’ Foundation for awards towards CPD for Conservation Professionals. 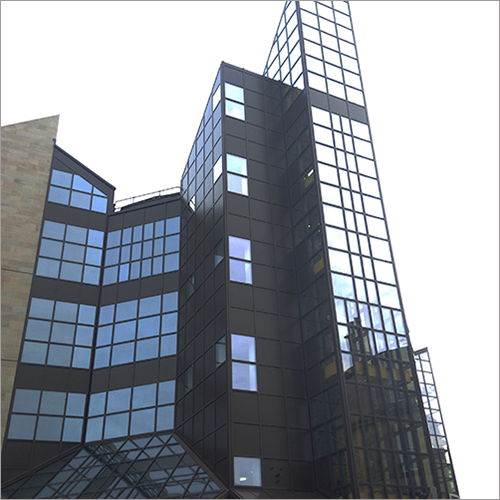 In September I received an email with a decision that my application had been successful, and that the organisations would help with the cost of attending a ‘Book Conservation Skills for Paper Conservators’ workshop held in the National Library of Scotland in Edinburgh on the 14th and 15th November. In addition to this grant, I was also supported by the Design Archives to attend the workshop – so off I went to bonnie Scotland last week to learn! First I must confess I arrived at this workshop with next to no knowledge of book conservation processes. I have a basic understanding of bookbinding techniques and some idea about the different types of bindings out there, but have never attempted or discussed book conservation in any shape or form. To be completely honest with you, the thought of it has always utterly terrified me as I have always felt there were simply too many things to consider when it came to the treatment/conservation/preservation of books. We were a group of 10 eager people from various institutions from all ends of the country with varying professional backgrounds, including a Masters student from Cardiff University and a lady who came all the way from Kuwait to attend the workshop. 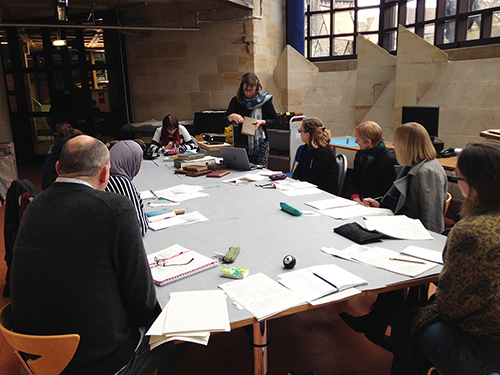 The course was led by freelance Book Conservator Caroline Scharfenberg ACR. We began by Caroline running us through a condensed history of bookbinding, giving us a general idea of the timeline for different types of bindings and materials, as well as the vocabulary used by binders and adopted by conservators. We went through the different types of damage you might come across including physical, biological, chemical and mechnical. We also talked about the different tools, materials, techniques, handling and appropriate ethical considerations to think about prior to any ‘action’. 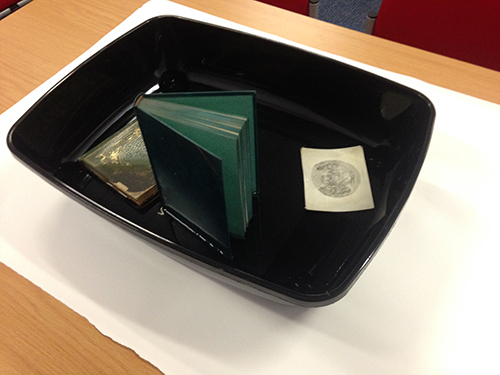 We were given a selection of books from the National Library of Scotland’s collections to choose from to assess. We talked through what an assessment and a treatment plan should consist of whether this was done for an individual volume or a collection of books. Caroline shared with us her own documentation as an example from which we could create ones suitable for our own and/or our institutions’ needs. The most eye-opening thing in relation to the documentation process was to be given parts of Robert Espinosa’s structure outline for book description documentation – I am sure you would agree, this is rather extensive! The book cover structure and its text block always need to be considered separately with any treatment plans, making the process twice as difficult – or fun, if you’re that way inclined! I wanted to share with you just one of the processes we went through at the workshop: consolidation and stabilisation of a damaged corner. The book I was working on from the Library’s collections was entitled ‘Pinkerton’s Enquiry into the History of Scotland Preceding 1056, Vol. 1’. The process started by assessing the damage to the text block and the covers and listing all visible damage carefully, while documenting the original state of the book with photographs. 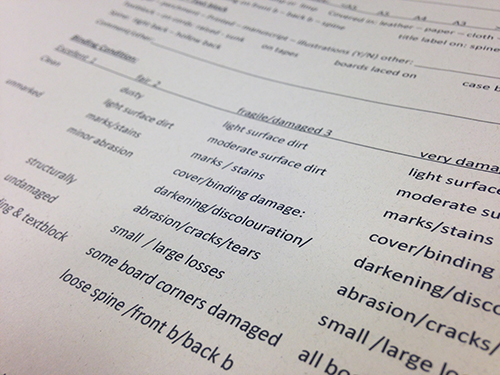 All damages listed needed to be analysed and explained in terms of how they affect the book as a whole. It then needs to be thought out if treatment is absolutely necessary and what the alternatives might be. The final decision on how to proceed needs to be a joint one by all involved – this will lead to a better understanding of the processes by everyone. The exchange of knowledge also allows, and leads into, better treatment decisions. 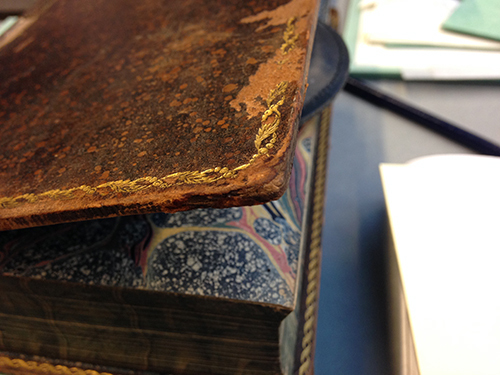 Below on the left you can see the original condition of the book cover and corner in question. 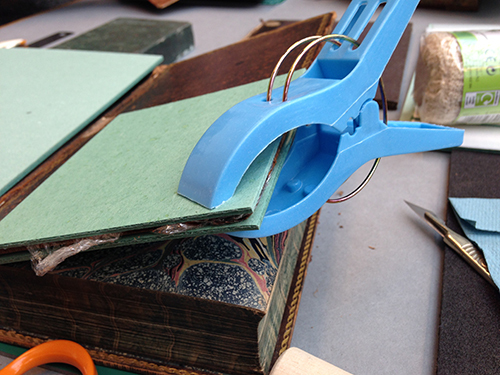 By following instructions from Caroline’s demonstrations, the corner leather and book board were cut with a scalpel and lifted. This is done by going about 5mm beyond the extent of the damage. 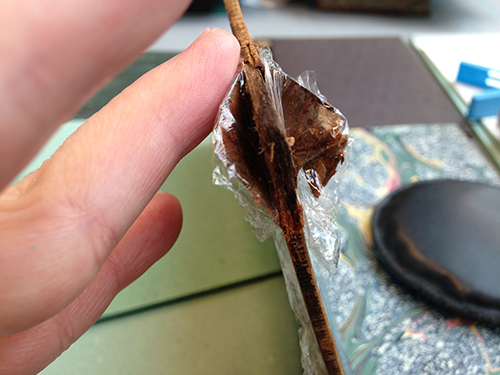 The book board inside was sliced inwards in three places to enable its consolidation. After lifting the corner, the book cover leather needed to be consolidated with Klucel G, also known by its rather less fetching name of hydroxypropylcellulose. 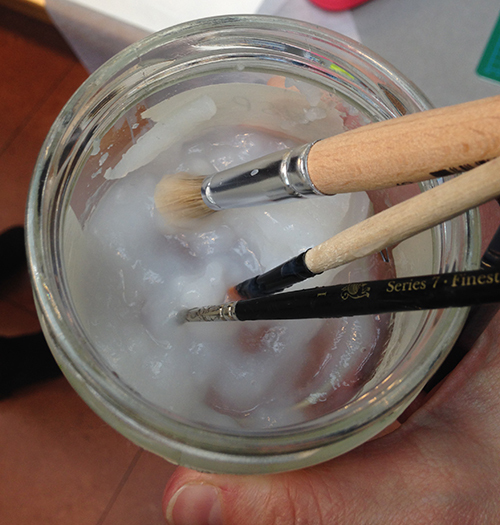 Klucel G is a consolidant which forms a gel and is used by painting it on damaged areas with a brush. 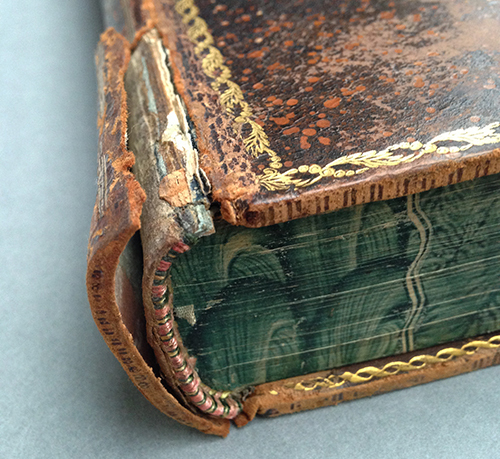 The lifted leather corners were painted with Klucel G with a thin blotter to separate it out from the text block. This was left to air-dry for around half an hour. When the Klucel G has dried, pieces of cling film were placed undeneath the leather to screen it off from the board. The next step was to use a 10% wheat starch paste with a thick consistency to consolidate the board (image below). The paste is worked into the board and brushed in as far as the board is open to reach all the nooks and crannies. It looked very gloopy (and a tad scary!) at this point, but this is then left as it is between 3-10 minutes – with care taken to not get any of the paste on the leather. After this, the boards got pushed together any excess paste was wiped off while shaping the corner back to its original shape. This gets clamped down anywhere from 10 minutes to an hour with the cling film still in place to avoid contact between the leather and the wheat starch paste. Once the paste has soaked into the board thoroughly, the corner was left to air-dry for a few hours. When fully dried, the leather and the board were again re-united by using EVA glue (ethylene-vinyl acetate) and left to dry thoroughly for an hour or so, first with clamps and then without. 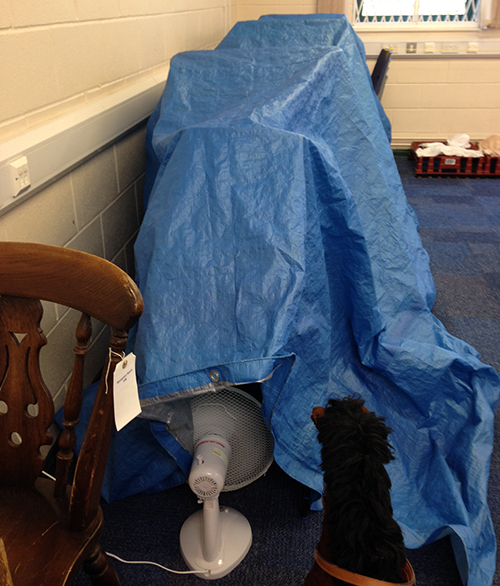 And there we have it – a stabilised book corner! Again I must point out the time conservation treatments can take: to consolidate one corner of a book, including all the drying times, can take over 5 hours. It was interesting to think and discuss the ways in which book collectors, and ‘everyday book users’, view books: what matters the most is the content of the book with the bindings coming in second. The conservation perspective is to think of the book strucure being a part of the information contained within a book. I find the difference between these points of views fascinating and it is something I come across on a day to day basis at work too – the researcher being only interested in the content when my focus is mostly the condition of the paper on which the information sits. 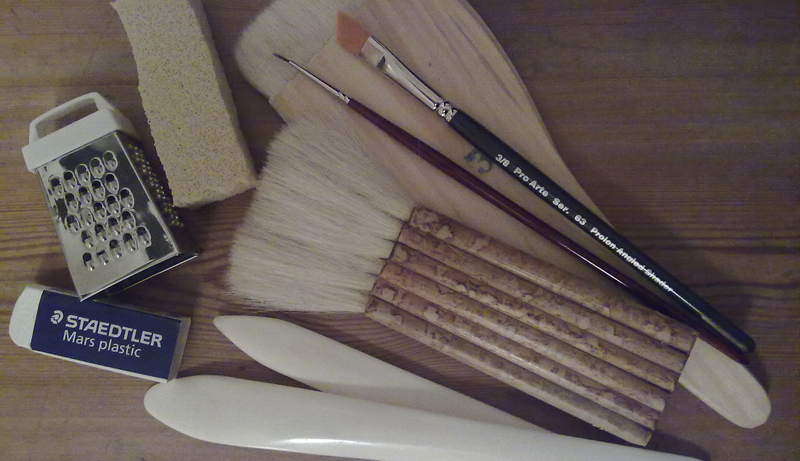 I can now, perhaps with slightly calmed nerves about the processes, extend this to include books.